We are offering Belt Conveyo to the clients. Our range of Belt Conveyors is demanded in the market as it accelerates production speed. 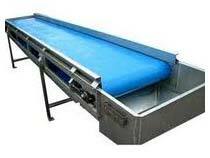 Our Belt Conveyor is used in various industries for optimum and convenient production flow. Also, these Belt Conveyors are dynamically balanced for clean rotation. We offer Belt Conveyor at market leading prices.